Reading and share top 35 famous quotes and sayings about Observance by famous authors and people. Browse top 35 famous quotes and sayings about Observance by most favorite authors. 1. "The discrepancy between the modern observance and the prescriptions of the Rule had struck me ever since the novitiate, and no satisfactory explanation had ever been given to me. People said that man had changed: the weakness of people's health no longer allows us to fast. Was it true?" 2. "Moreover, most people, assuming they had not altogether abandoned religious observances, or did not combine them naively with a thoroughly immoral way of living, had replace normal religious practice by more or less extravagant superstitions." 3. "Most morality, thought Mma Ramotswe, was about doing the right thing because it had been identified as such by a long process of acceptance and observance. You simply could not create your own morality because your experience would never be enough to do so. What gives you the right to say that you know better than your ancestors? Morality is for everybody and this means that the views of more than one person are needed to create it. That was what made modern morality, with its emphasis on individuals and the working out of an individual person, so weak. If you gave people the chance to work out their morality, then they would work out the version which was easiest for them and which allowed them to do what suited them for as much of the time as possible. That, in Mma Ramotswe's view, was simple selfishness, whatever grand name one gave it." 5. 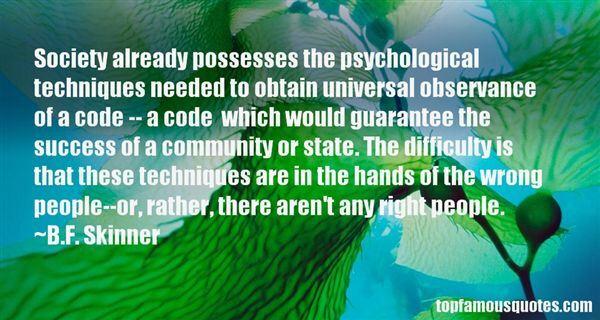 "Society already possesses the psychological techniques needed to obtain universal observance of a code -- a code which would guarantee the success of a community or state. The difficulty is that these techniques are in the hands of the wrong people--or, rather, there aren't any right people." 6. "Being an artist for my well being and as a living, I live in a place of observance and interest in what I consider to be the most relevant questions." 7. "I don't see 'lines of force' as being destructive, except to the extent that they are exclusively traceable through observance of the path of distorted material left in their wake." 8. "Observance of customs and laws can very easily be a cloak for a lie so subtle that our fellow human beings are unable to detect it. It may help us to escape all criticism, we may even be able to deceive ourselves in the belief of our obvious righteousness. But deep down, below the surface of the average man's conscience, he hears a voice whispering, 'There is something not right,' no matter how much his rightness is supported by public opinion or by the moral code." 9. "137 years later, Memorial Day remains one of America's most cherished patriotic observances. The spirit of this day has not changed - it remains a day to honor those who died defending our freedom and democracy." 10. "We are afraid of religion because it interprets rather than observance. Religion does not confirm that there are hungry people in the world; it interprets the hungry to be our brethren whom we allowed to starve." 11. "It was much less dangerous for the disciples of Christ to neglect the observance of the moral duties, than to despise the censures and authority of their bishops." 12. "As you grow in true spiritual power and understanding you will actually find that many outer rules and regulations will become unnecessary; but this will be because you have really risen above them; never, never, because you have fallen below them. This point in your development, where your understanding of Truth enables you to dispense with certain outer props and regulations, is the Spiritual Coming of Age. When you really are no longer spiritually a minor, you will cease to need some of the outer observances that formerly seemed indispensable; but your resulting life will be purer, truer, freer, and less selfish than it was before; and that is the test." 13. "A general summing up, such as this, is highly characteristic of the old Oriental mode of approach to a religious and philosophical teaching, and it naturally recalls the Eight-fold Path of Buddhism, the Ten Commandments of Moses, and other such compact groupings of ideas. Jesus concerned himself exclusively with the teaching of general principles, and these general principles always had to do with mental states, for he knew that if one's mental states are right, everything else must be right too, whereas, if these are wrong, nothing else can be right. Unlike the other great religious teachers, he gives us no detailed instructions about what we are to do or are not to do; he does not tell us either to eat or to drink, or to refrain from eating or drinking certain things; or to carry out various ritual observances at certain times and seasons. Indeed, the whole current of his teaching is anti-ritualistic anti-formalist." 14. "The history of liberty has largely been the history of the observance of procedural safeguards." 15. "The Olympian vice.--In defiance of that philosopher who as true Englishman tried to give any thinking person's laughter a bad reputation ('Laughter is a nasty infirmity of human nature that any thinking person will endeavour to overcome'---Hobbes), I would actually go as far as to rank philosophers according to the level of their laughter---right up to the ones who are capable of golden laughter. And assuming that gods, too, are able to philosophize, as various of my conclusions force me to believe, then I do not doubt when they do so, they know how to laugh in a new and superhuman fashion---and at the expense of everything serious! Gods like to jeer: it seems that even at religious observances they cannot keep from laughing." 16. "Not merely by rules of conduct and religious observances, nor by much learning either, nor even by attainment of concentration, nor by sleeping alone, do I reach the happiness of freedom, to which no worldlings attain. If you have not put an end to compulsions, nurse your faith"
17. "To the house of a friend if you're pleased to retire, You must all things admit, you must all things admire; You must pay with observance the price of your treat, You must eat what is praised, and must praise what you eat." 18. "...I have come to be convinced that it is only the unbending observance of custom that sustains life in an urban circumstance." 19. "When prayer, rituals and ascetic life are just a means of self-indulgence, they are harmful rather than beneficial. This is quite obvious to people nowadays, when it is widely recognised that fixations are not the same as valuable and laudable observances. One should not pray if that prayer is vanity; rituals are wrong when they provide lower satisfactions, like emotional stimulus instead of enlightenment; he or she should not be an ascetic who is only enjoying it." 20. "Good luck is the willing handmaid of a upright and energetic character, and conscientious observance of duty." 21. "One good thing that comes from living the nomadic life demanded by an expedition is that one sheds the fake skin donned from living too closely among society. For those of us who live for the freedom of such a lifestyle, that skin is dry and itchy and ill fitting. From my observances, that skin is much like a callus caused by the pure irritation of being forced to spend so much time with one's fellow man. Thank God I am spared such nonsense." 22. "Both the Obama and Romney campaigns said they pulled all their political ads today in observance of the September 11th anniversary. But politics wasn't very far offstage. The Obama campaign sees foreign policy as an advantage this year." 23. 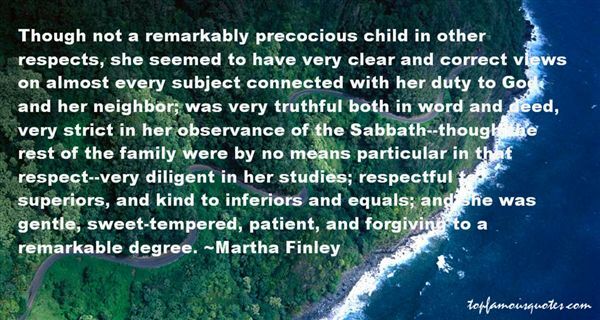 "Though not a remarkably precocious child in other respects, she seemed to have very clear and correct views on almost every subject connected with her duty to God and her neighbor; was very truthful both in word and deed, very strict in her observance of the Sabbath--though the rest of the family were by no means particular in that respect--very diligent in her studies; respectful to superiors, and kind to inferiors and equals; and she was gentle, sweet-tempered, patient, and forgiving to a remarkable degree." 24. "The heart of compassion is the germ of benevolence; the heart of shame, of dutifulness; the heart of courtesy and modesty, of observance of the rites; the heart of right and wrong, of wisdom. 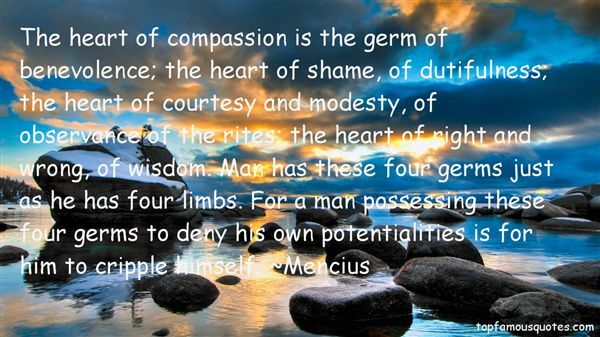 Man has these four germs just as he has four limbs. For a man possessing these four germs to deny his own potentialities is for him to cripple himself." 25. "But there was always a shortfall, wasn't there? Between the match that the Holy One, blessed be He, envisioned and the reality of the situation under the chuppah. Between commandment and observance, heaven and earth, husband and wife, Zion and Jew. They called that shortfall 'the world.' Only when Messiah came would the breach be closed, all separations, distinctions, and distances collapsed. Until then, thanks be unto His Name, sparks, bright sparks, might leap across the gap, as between electric poles. And we must be grateful for their momentary light." 26. "And as the observance of religious teaching is the cause of the greatness of republics, similarly, disdain for it is the cause of their ruin. For where the fear of God is lacking, the state must necessarily either come to ruin or be held together by the fear of a prince that will compensate for the lack of religion." 27. "...men whose first coronary is coming like Christmas; who drift, loaded helplessly with commitments and obligations and necessary observances, into the darkening avenues of age and incapacity, deserted by everything that once made life sweet. These I have tried to remind of the excitement of jazz and tell where it may still be found." 28. "We find that the Romans owed the conquest of the world to no other cause than continual military training, exact observance of discipline in their camps, and unwearied cultivation of the other arts of war." 29. "The need for civility in society has never been more important. The foundation of kindness and civility begins in our homes. It is not surprising that our public discourse has declined in equal measure with the breakdown of the family. The family is the foundation for love and for maintaining spirituality. The family promotes an atmosphere where religious observance can flourish. There is indeed beauty all around when there's love at home." 30. "Is there a problem, Ms. Parker? Something you want to say to me?" Reaching for his tie, he began to loosen it, unraveling it with his fingers, angry eyes still locked on mine. "I'm not sure I like being your pet. Or science project, I don't know which. ""You have a smart mouth. ""You make smart observances. ""You're going to make this invitation difficult, aren't you? ""If you're dishonest with me, yes. ""You'll regret it if you don't accept. ""Is that a threat? ""That's a promise." 31. "A strict observance of the written laws is doubtless one of the highest virtues of a good citizen, but it is not the highest. The laws of necessity, of self-preservation, of saving our country when in danger, are of higher obligation. To lose our country by a scrupulous adherence to written law would be to lose the law itself, with life, liberty, property and all those who are enjoying them with us; thus absurdly sacrificing the end to the means." 32. "Oskar showed that virtue emerged where it would, and the sort of churchy observance bishops called for was not a guarantee of genuine humanity in a person." 33. "One hour of life, crowded to the full with glorious action, and filled with noble risks, is worth whole years of those mean observances of paltry decorum, in which men steal through existence, like sluggish waters through a marsh, without either honor or observation." 34. "Sacrifices alone can never please God, for along with the outward observance, God wants inward obedience (1 Sam. 15:22), a broken heart (Ps. 51:17), and a godly walk (Mic. 6:6–8)." 35. "Be not too tame neither, but let your own discretion be your tutor: suit the action to the word, the word to the action; with this special observance, that you o'er-step not the modesty of nature: for anything so overdone is from the purpose of playing, whose end, both at the first and now, was and is, to hold, as 'twere, the mirror up to nature; to show virtue her own feature, scorn her own image, and the very age and body of the time his form and pressure." You're already naked in this worldin this timein this lifebeacause your next loveyour next hungeryou next laughterand even your next tearmay never come"